Again the University of the Witwatersrand (Wits) has been in the headlines. This time not Fees Must Fall protests, but a labour dispute. An end to the seven-day strike, just before teaching commenced for the academic year, meant that a further possible student-worker alliance over insourcing was never tested. Nevertheless, several critical issues were at stake. Some still are. By DAVID DICKINSON. Wits has four unions with memberships linked to occupational status and/or race: two “enterprise” unions with membership restricted to the university: Asawu for academics (still predominantly white); Altsa for white-collar administrative workers (typically Indian and coloured employees); and two national unions, Nehawu (a Cosatu affiliate) and Numsa (the keystone union of the new Saftu federation). Nehawu largely represents African support and administrative workers. Numsa similarly, except that its core membership comes from the recently insourced cleaners, gardeners, cooks and maintenance workers, the bulk of whom are in the newly-created, lowest pay grade: 17A. In a show of unity that recalled the strikes of 2012, all unions declared disputes with management. A key factor in cementing this was a clumsy union busting move by management, and behind them the University’s Council. Council, the governing body of the university, is dominated by a corporate philosophy and has, for years, been attempting to impose business principles on a public, educational institution. In the context of real reductions in government funding, to which council has acquiesced, this approach has led to persistent cost cutting and, inevitably, cutting corners: maintenance spending, for example, is only 50% of estimated requirement. Performance management has become an obsessive quest for council: a corporate elixir for an increasingly stressed institution; or at least it is so believed by a majority of members drawn from outside the institution. Academics have resisted with Senate, the highest academic body of the University arguing that a bureaucratic performance management system is the wrong solution to the wrong problem. Negotiators from all unions were frustrated when council and senior management employed a “pillar to post” strategy, hiding behind each other when it came to the question of who was making decisions. When talks eventually deadlocked, management, in an unprecedented move, emailed every Wits employee with an individual take it or leave it offer. Agree to the pay increase and in doing so agree to performance management or don’t and get no pay increase for 2018. Exactly who came up with this idea isn’t clear, but it backfired badly. There was anger across the unions’ membership and a “don’t talk to me, talk to my union” campaign in response. One explanation for this ill-considered gambit is the increasing securitisation of campus. The extensive use of private security was initially a response to the Fees Must Fall protests. “The Bouncers” now amount to a private army that management can mobilise, ignoring budget constraints, at short notice. It’s hard not to see this fostering a sense of invulnerability, making management willing to do council’s bidding and go head to head with the universities employees. But if that was the reason, it failed to distinguish between student protests and workers withdrawing their labour. Of course, the dispute was about money. Indeed, what really gave it fire was the recently insourced workers seeking to improve their financial position. Across the board, percentage offers from council/management, which in real terms amounts to very little for low-paid workers, increased the heat. The fire was further fuelled by Numsa and Nehawu competing for the same membership. Despite the complexities of a four-union alliance, the unions agreed on the need to close the wage inequality within Wits’ pay scales. Paradoxically, insourcing has increased the spread of wages across Wits employees by creating a further pay grade below the 17 already in place. While insourced workers’ salaries increased to a minimum R7,500 a month, this is still one-thirty-seventh of the Vice Chancellor’s annual salary of over R3-million (in 2016 and not including the 20% executive bonus available for executive managers). This ratio of 1:37 is significantly lower than that in South Africa’s private sector, but then the private sector doesn’t trumpet the problem of income inequality and set up, as Wits recently did with fanfare, the Southern Centre for Inequality Studies. Although management provoked the strike when it bypassed the unions in an attempt to impose Council-desired corporate principles, it was Nehawu and Numsa members who rallied and came out on an indefinite strike – Nehawu ahead of Numsa by two days. The threat of academics taking action in the first week of term may have applied additional pressure. An Asawu meeting had resolved to enforce fire regulations on teaching venues, since first-year classes are now routinely scheduled in lecture theatres with insufficient seating for attending students; a sign of the institution’s failure to match infrastructure to increased student numbers. 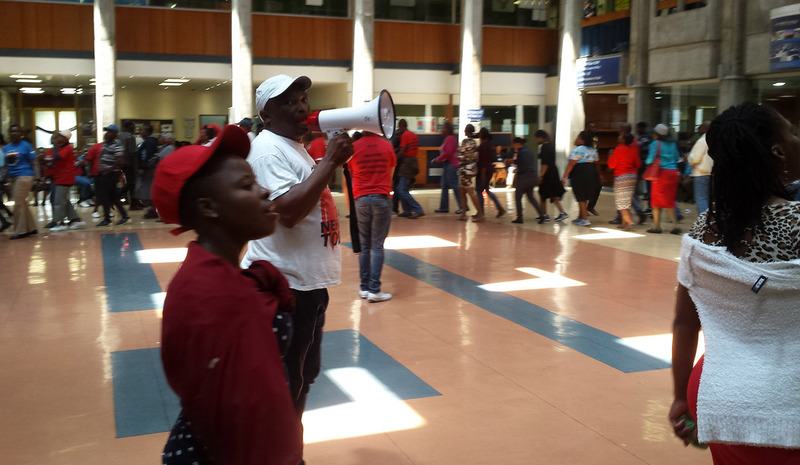 However, since the strike was over before term started academics and Altsa members who stopped short of striking rode on the backs of the workers, welcoming the eventual settlement. The most significant part of the settlement is that it was just that; a settlement with the unions. Management’s individual contracts approach is in the dustbin and is unlikely to be tried again for a while. Now for the money. Academics and senior administrators get 7%; mid-level grades get 7.8%, and the lowest three grades, 9.2%. This is a progressive step; though nowhere near what those who bore the brunt of the strike, with seven days lost pay (converted to leave) were seeking. Council’s requirement that employees must be members of a medical aid scheme has exacerbated the financial stress of the newly insourced workforce. While insourcing increased their salaries, now they must fork out for medical aid cover. So far, no news on what the top four grades (senior management) will receive, or the size of executive bonuses. In theory 0.4% of this year’s salary increase is to be linked to performance. In practice, the matter is to go to arbitration. Beyond this year, there is an agreement to set up a “representative committee” to discuss “measures to improve performance and productivity”. This could be an important step in moving Wits forward, but it may also just be kicking the can down the road. It’s far from clear whether trench warfare between council and senior managers on one side and senate, academics and the unions on the other over performance management is really at an end. Many academics are wary of what might emerge given that considered, well-researched responses and suggestions have in the past been dismissed, sometimes rubbished, by council. Deferred engagements have been agreed for other remaining points of disagreement, including the 2016 unilateral stripping of long-service awards of their monetary value. Management’s confidence that this could be managed smoothly must be questioned given that this move, as some predicted, angered support staff for whom the payments provided a welcome opportunity to improve their lives. Hectoring over performance management is (bizarrely) delivered year after year along with news of increasing research output and increased student numbers. This adds to the demoralisation of an increasingly fragmented academic staff. Many senior academics, predominantly white, are livid at council’s collapsing of the institution’s medical aid scheme, and are counting down to retirement or looking elsewhere. Below them are increasing numbers of sessional lecturers standing in front of classes, the steady casualisation of the university’s teaching creating a largely-African, precarious academic workforce. As yet still weakly organised, this group bridles at the lack of career opportunities that their white seniors enjoyed. New academic posts that do come come involve crushing workloads which make balancing teaching, research, administration, community engagement all but impossible, not to speak of family life.